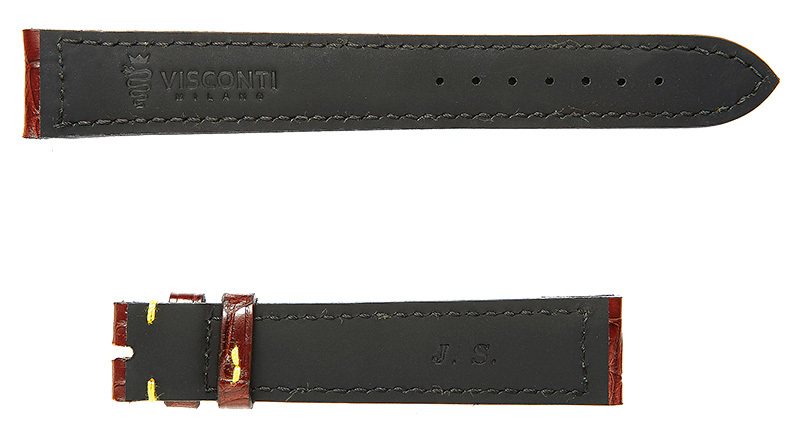 Every Visconti Milano watch strap style is available for personalized order. The bespoke production takes around 30 business days*. If you need a custom shape, material or color please contact us at info@viscontimilano.com for personal rendering and quotations. All the products marked “Available On Backorder” are temporary not in stock for immediate shipping, but will be produced for your 100% prepaid order within 30 business days*. Meanwhile making the backorder you can specify your special requests about the product at the “Check out” page filling out the field “Order notes” below the shipping address details. For example, let us know if you wish to place your initials on a lining part on the future strap. The backordered product bespoke production time is around 30 business days*. All Visconti Milano watch straps and leather goods are produced in Italy by Italian artisans. * Italian factories are closed for vacations in August. Backorders and Bespoke production orders made from 20 July until the end of August will need an extra 20 days in production time. We apologise for any inconvenience.